Drug-related deaths continue to rise in Arizona. The suicide rate in the state was 16 per 100,000 in 2007.6 As of 2013, the rate was 12.6 per 100,000 nationwide7 Those who are fortunate enough to escape overdose despite abusing drugs like heroin and crack cocaine still face other risks. Not only can substance abuse come with losing important relationships, losing custody of children, and breaking up marriages, it can also impose some pretty hefty jail and prison sentences. Possession of marijuana sentences start at two years behind bars and can extent to up to $150,000 in fines.8 Being caught with heroin comes with a minimum of 2.5 years in jail.9 While these charges are everyday occurrences across the United States, Mesa is specifically exposed to more drug trafficking-related crimes and seizures than most other states in the nation. This is primarily to blame on the strong surge of drug trafficking activity that crosses Mexican borders on a regular basis and infiltrates in the southwestern US. According to 2012 treatment statistics, 4,844 people sought treatment for alcohol abuse alone at Arizona facilities, in addition to 3,450 individuals who cited abuse of alcohol along with abuse of other illicit substances.13 Alcohol abuse is a common trend across the nation, and the trend shows no signs of slowing down. Since the development of the Affordable Care Act in 2010, insurance providers are now required to cover the cost of substance abuse treatment care. This certainly doesn’t apply to individuals without healthcare though. For them, many facilities offer structured payment options. You may be able to make timely payments over the course of your treatment period. Other facilities may offer sliding scale plans that are aligned with your income. Moreover, social services and Medicaid are financial options for many in the Mesa area who need access to treatment they cannot reasonably afford. Your health is top priority, and getting clean is the first step. From 2010 to 2013, 45.5 percent of individuals who went without treatment did so because they didn’t know how to pay for it.29 But you have choices even if you don’t have health insurance. There are several resources in the local vicinity to help you, such as the Arizona Department of Health Services and the New Foundation. These organizations can also assist you in determining which facility best suits your treatment needs. Rest assured they will never recommend any treatment center that isn’t up to code and operating within state and national guidelines. “Arizona Drug Control Update.” (n.d.). White House. Accessed September 20, 2015. “Substance Use and Mental Health Estimates from the 2013 National Survey on Drug Use and Health: Overview of Findings.” (2014 Sep 4). Substance Abuse and Mental Health Services Administration. September 20, 2015. “2011 State Profile — Arizona.” (2011). SAMHSA. September 20, 2015. Radnovich, C. (2013 Jan 21). “Report: Arizona has nation’s sixth-highest prescription drug abuse rate.” ABC News. September 20, 2015. “Substance Abuse Treatment Admissions by Primary Substance of Abuse.” (2012). SAMHSA. September 20, 2015. “Suicide: 20 states with the highest rates.” (n.d.). CBS News. September 20, 2015. “Facts and Figures.” (n.d.). American Foundation for Suicide Prevention. September 20, 2015. “Arizona Laws & Penalties.” (n.d.). NORML. September 20, 2015. “Arizona Heroin Laws.” (n.d.). FindLaw. September 20, 2015. Holland, C. (2014 Dec 19). “4-month drug investigation ends with Mesa woman’s arrest.” KPHO. September 20, 2015. “Substance Use and Mental Disorders in the Phoenix-Mesa-Glendale MSA.” (n.d.). SAMHSA. September 20, 2015. “State Statistics: Arizona.” (2010). National Alliance on Mental Illness. September 20, 2015. 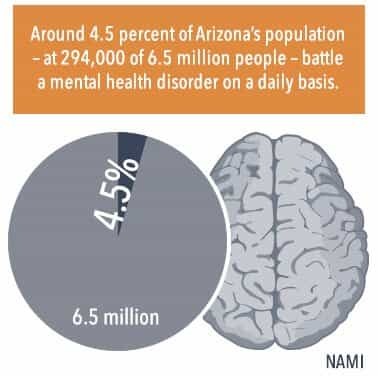 “NAMI’s New Fact sheets on the Uninsured and the Costs of Mental Illness.” (Aug/Sep 2007). National Alliance on Mental Illness. September 20, 2015. “Substance Abuse Treatment Facility Locator.” (n.d.). Substance Abuse and Mental Health Services Administration. Accessed September 15, 2015. “State and County QuickFacts.” (2014). United States Census Bureau. September 20, 2015. Bloomquist, M. (n.d.). 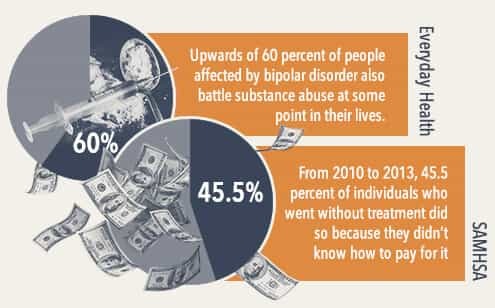 “Bipolar and Addiction: The Dual Diagnosis.” Everyday Health. September 20, 2015. “Sober Living Directory.” (n.d.). Intervention America. September 20, 2015.